Before anything else, let me say thanks again to Pete McCole for filling in so wonderfully while I was away on vacation. I’ve returned just in time for the start of the championship Countdown. All four of the Mello Yello professional classes will run the next six events to determine champions starting this weekend with the NHRA Carolina Nationals from zMAX Dragway in Charlotte. Only two-wide this time, not four. Everyone wants to get off to a strong start and win in Charlotte because momentum is priceless. You can’t win or lose the championship in Charlotte, and drivers have come from behind, but you absolutely can help give yourself the best possible chance by getting off to a strong start. Just ask Top Fueler Antron Brown and Pro Stock pilot Jason Line. Both drivers won the Countdown opener in Charlotte and went on to win the championship in 2016. Brown did the same trick in 2015 along with Funny Car’s Del Worsham, Pro Stock’s Erica Enders, and Pro Stock Motorcyle rider Andrew Hines. That’s right. The results of the Carolina Nationals in 2015 were a mirror of the eventual season champions. 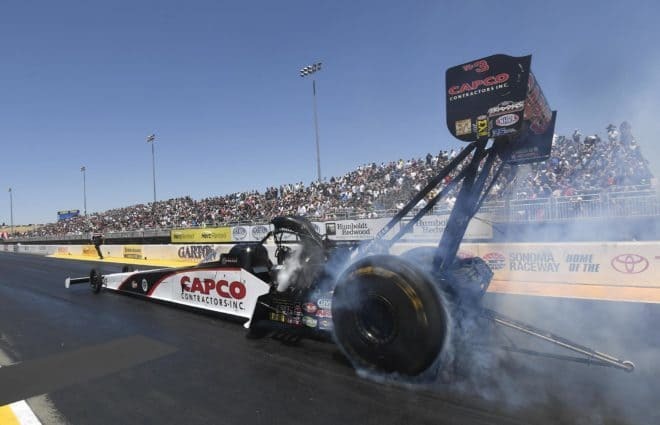 You can bet Steve Torrence, Ron Capps, Bo Butner and LE Tonglet, and really all of the contenders, are looking to have a good weekend in Charlotte. Speaking of Charlotte, while Pete already made note of this piece of news, I wanted to offer my thoughts about Charlotte no longer being the site of the only four-wide drag race currently being contested. The idea of adding a four-wide event in Las Vegas has been bouncing around the rumor mill for a while and it honestly makes perfect sense. Bruton Smith’s experiment has worked out well in Charlotte. Say what you will about it being a gimmick; the simple fact is that the spring four-wide event draws a crowd. In recent years, the track has sold out on Saturday. That never happens for the two-wide event in the fall, even with the appeal of it being the opening round of the championship Countdown. One has to believe they come to see the four-wide action. Las Vegas is thousands of miles away, clear on the other side of the country, and also owned by Smith’s Speedway Motorsports, Inc. It makes sense for the track and it makes sense for the fans on the west coast. There’s no way they weren’t going to do this. It’s still a little sad to see Charlotte lose what it was that made it a unique venue, though. And for television viewers, it also takes a little of the novelty away because the two events will run so close together, within just a few weeks of each other. Glad, however, to see the temptation to put one of the events in the Countdown (both tracks host Countdown races) was resisted. Great video from NHRA showing how Top Fuel and Funny Car engines work. It also explains why they sometimes don’t work in spectacular fashion. We’ll make this a double feature. Here is a young lady to keep an eye on in the future. She could be an up and coming star.